It is impossible to redesign students to fit into a system, but we can re-design a system for students. This can be the difference between success or failure for our students that need the promise of higher education the most. 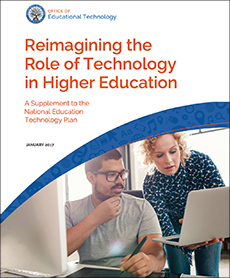 Reimagining the Role of Technology in Higher Education a supplement to the 2016 National Educational Technology Plan (NETP), builds on the principles described in each of the NETP’s five sections—learning, teaching, leadership, assessment, and infrastructure—and examines them in the context of higher education. The supplement embraces the themes of lifelong learning, equity, and accessibility and supports the NETP’s assertion that technology must serve the needs of a diverse group of students seeking access to high-quality postsecondary learning experiences, especially those students from diverse socioeconomic and racial backgrounds, students with disabilities, first-generation students, and working learners at varying life stages – all with differing educational goals, but who all share the desire to obtain a postsecondary credential. Addresses five essential components of learning powered by technology: learning, assessment, teaching, infrastructure, and productivity.